Amazon’s launch in Australia helped grow online shopping traffic 9.1 per cent and boosted interest in Australian ecommerce sites, according to the latest analysis from Mindshare. In good news for local businesses, Mindshare’s research found that after Amazon’s launch Australians have begun to turn away from overseas retailer and brand websites, preferring to increase spending with locally based ecommerce and brand websites. Amazon itself has grown 24% post-launch (Feb-Apr 2018 vs Feb-Apr 2017), adding 1.3 million visitors per month. It’s a significant turnaround after dropping 11% in 2017. Analysis of website traffic also found the majority of local brands, including Catch, Kogan, Kmart and Dan Murphy’s, grew penetration following the launch of Amazon.com.au. Not all brands are thriving, however, in particular mid-sized, specialist brands with lower awareness and consideration for their online offering. Many are operating in traditional areas of strength for Amazon.com, with EB Games, Booktopia and Harvey Norman – as well as market leader Ebay – all losing traffic year-on-year. The research looked at online shopping behaviours before and after Amazon’s Australian launch, in order to cut through the hype and evaluate Amazon’s true impact on the Australian marketplace. 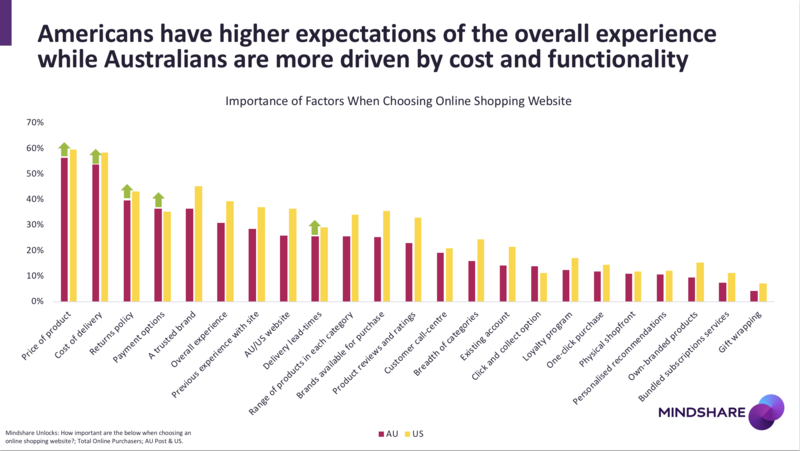 Price and delivery costs are unsurprisingly the two most important factors for Aussie shoppers. However Americans have higher expectations from their ecommerce providers, with their appreciation for Amazon.com driven more by the overall offering, despite years of aggressive discounting. By contrast, consideration for Amazon.com.au has dropped from 19% to 15% post-launch, with price and delivery the two major barriers. 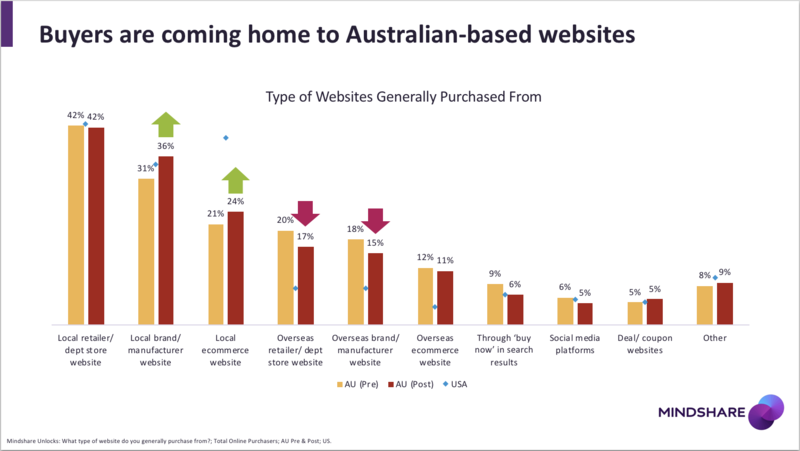 However positive perceptions of Amazon.com.au align closely to Amazon.com’s positioning with US customers, although it’s still very early days in the brand’s development locally. The introduction of Amazon Prime, which will bundle free delivery with unlimited video and music streaming packages, will be key to addressing pricing concerns locally. Mindshare’s research found that on average people would be willing to pay $14 per month for Amazon Prime, with that increasing to $22 for millennials (18-34) and up to $32 for frequent online buyers. Prime is crucial to the success of Amazon, because they don’t appear to be converting as many young, heavy online shoppers at this early stage. As a result, most sales post-launch appear to have come from existing Amazon shoppers, with the original early adopters of Amazon still tending to use the site for the traditional ecommerce categories of books, DVDs and CDs, followed by clothing and accessories. Lunn added: “Amazon.com.au didn’t quite live up to the pre-launch hype. Previous users of Amazon.com were the most excited, but they were also the most disappointed, with excitement dropping from 41% to 28%. “Amazon doesn’t yet appear to have convinced them to make the switch to the local platform, which possibly explains the company’s decision to use the GST changes as a prompt to switch off local access to Amazon.com. Mindshare collaborated with various WPP partners in the delivery of this study, including Kantar Millward Brown, Kantar Retail, GroupM’s [m]Platform, Hogarth, Shop+ and FAST. 5,500 respondents were surveyed using Kantar’s Ignite panel and GroupM’s LIVE Panel, in a nationally representative sample of People 18+ across Australia (n=4,500) and the US (n=1,000). Respondents were matched to digital behaviours using GroupM’s [m]Insights planning tool. Website visitation data was sourced from Nielsen Answers. Global Amazon penetration was sourced from Mindshare’s Mindreader Survey 2017 (n=50,000). The media partner for the research study was News Corp.